Calendars is rated 5.0 out of 5 by 5. Print calendars that are customized for your organization. Rated 5 out of 5 by jcrhs from Another Great Job This is the fifth calendar we have had printed at PrintPlace,com and they have all been top notch. The staff is very helpful and friendly. While this year's edition didn't require any editing, in the past the staff has worked to make the final product just what I wanted. Rated 5 out of 5 by DanP from Quality keeps impressing I selected PrintPlace several years ago because the quality was better than the average. Each year I can see even greater improvements which solidify it as a leader. The recent calendar order was sharp in color but also texture. Thanks! Rated 5 out of 5 by r-2. from Great quality printing I like a job with no problems. We have been printing our calendars with PrintPlace for about 10 years. Generally the jobs go well and we have not had problems. The calendar printing is beautiful. A couple of times I have messed up the files, and had to resubmit, but otherwise we have always been happy with the printing. We have had shipping issues, where the boxes have been manhandled and the calendars banged up, but PrintPlace has always been supportive. Make a calendar online for personal or business purposes. People like to receive calendars as gifts or promotional items. They are also great donation-level incentives for fundraising drives put out by nonprofit organizations. Everyone can use a wall calendar for their kitchen or office. They can even be put up in the fridge. Make sure they have yours so your business name hangs in front of them every single day. Need calendars now? Same day and 1-day printing are available. For additional custom options fill out our custom order form or call us at 877-405-3949, M-F (7am-8pm CT). PrintPlace offers layout templates to ensure your calendar artwork meets our printing requirements. Our guides are available in several formats to make layout simple for your project. Find the best one for you below. By printing and mailing your calendars from one place, you can save time and money. 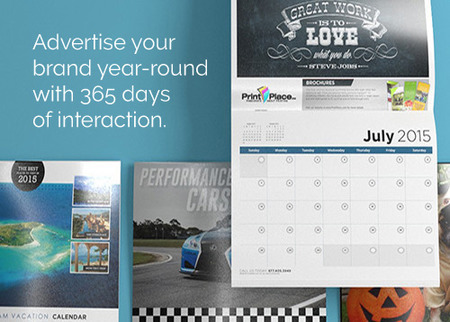 PrintPlace offers direct mail services for calendars so you can mail your custom calendars directly to clients and donors. Postage is quoted separately after checkout. Mini calendars (9” x 6” with portrait orientation) can be mailed at letter rate if triple tabbed or custom trimmed to 8.5” x 5.5” to fit in a 6” x 9” envelope. Calendars can mailed at a flat rate without envelopes or inserting can be added by contacting us. The trick to making a promotional calendar work is not to make it look like advertising. It’s important to include your logo and contact information, but don’t make that the center of attention. Include sales and events throughout the year by printing them on appropriate dates. Your customers won’t forget a date when it is printed on the calendar in front of them. The main focus of each page should be photos or designs that customers will want to hang up. You can use scenic pictures of wildlife, sunsets, or mountains. You can use your personal art. If you’re into photography, you can use your own images. With a little creativity, your calendar will be hanging in cubicles and kitchens all around your local community.